OLYMPIA – Stung by the defeat last year of their efforts to pass legislation to fight climate change, environmentalists this year are back on their heels and bracing to fight off attacks on state policies governing water, public lands and the fight against climate change, among other areas. In fact, for the first time since the state’s major environmental lobbying groups started laying out annual priorities a dozen years ago, they have made it formal: This year, they are pretty much just playing defense. Last year they not only couldn’t get the climate legislation approved, but they also saw a transportation bill pass that tied the state’s hands on mandating more-efficient fuels for cars and trucks. And they endured passage of a law to regulate oil transport by trains that was largely seen as a win for industry. Meanwhile, industry groups are working hard to make sure they don’t get surprised by anything coming out of the 2016 Legislature. “On a lot of stuff, we’re going to be on defense, too,” said Art Castle, executive vice president of the Building Industry Association of Washington, which represents developers. He cited, for example, a measure to add development fees to pay for long-range planning (HB 1802) that got a hearing in a House committee last week. Still, said Castle, echoing the common wisdom here, passage of major environmental policy changes is unlikely in an even-numbered year. Those are years when the regular legislative session is limited to two months and the main focus is on passing a budget. Just getting that done will be a huge task — one made especially difficult because the Legislature is being held in contempt of the Washington Supreme Court for failing to properly fund public education. The Association of Washington Business is “working hard to bring up questions” with legislators about two efforts the Inslee administration is pursuing outside the legislative arena, climate policy and clean-water regulations, said Brandon Houskeeper, the business group’s director of government affairs for environment issues. Last year Inslee’s proposal for a cap-and-trade system to reduce climate pollutants went nowhere, even in the Democratic-controlled House. So Inslee’s Department of Ecology instead this month unveiled plans to require power plants and other large industrial facilities to reduce their greenhouse gas emissions 5 percent every three years. 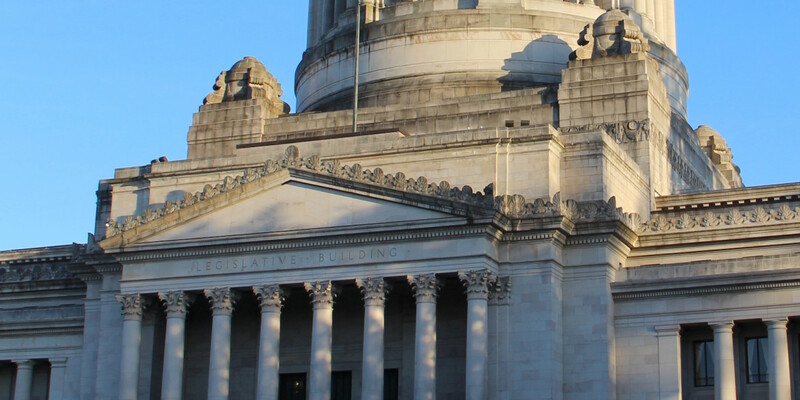 This week a bill to prevent Ecology from moving forward without legislative approval (SB 6173) cleared the Senate Energy, Environment and Telecommunications Committee, which is chaired by the measure’s sponsor, Sen. Doug Ericksen, R-Ferndale. Ecology also is working on a rule to determine how clean industrial wastewater discharges must be. It is intended to cap a years-long controversy that pitted environmentalists and Indian tribes against business interests, chief among them, as InvestigateWest revealed, The Boeing Co. But environmentalists have sued over that and last year the U.S. Environmental Protection Agency stepped in to say it would rewrite the clean-water rules itself. Houskeeper said both the climate and water issues are at the forefront of AWB’s lobbying efforts. “Our focus is on the regulatory uncertainties that businesses face in Washington state, and what they — the Legislature and the governor — can do to provide more certainty for businesses,” Houskeeper said. On the environmentalists’ side, advocates are split between two camps pushing initiative measures to fight climate change. Both would tax climate-warming greenhouse gases. One, I-732, would refund the money to taxpayers, primarily by lowering the sales tax by one percentage point. If legislators do not pass the initiative, it goes to the voters in November. (The Legislature could also amend it, and give voters a choice of the original and the amended versions.) The other initiative would divert the tax revenues to additional efforts to control climate change and help communities hit hard by it. Embraced by the major environmental groups as well as labor groups, the initiative has not yet been filed, but backers say they expect it to be on the November ballot along with I-732. Toxic waste-site cleanups. Funded largely by a percentage tax on oil, the Model Toxics Control Act cleanup funds are lagging far behind the needs, say environmentalists and the Ecology Department. The oil industry will likely fight any additional taxes. Water rights. Several recent court decisions favored tribes and environmental advocates over development interests when it comes to supplying new developments in rural areas with water. Even in a short session focused on the budget, some legislators may seek to upend those court decisions. Climate-friendly power. Voter-approved I-937 requires utilities to meet progressively larger requirements for adding renewable energy sources and achieving energy savings through efficiency. It’s a perennial target of some utilities. Other topics potentially to be taken up include extending or expanding state incentives for homeowners who install solar power, and the idea of asking the federal government to transfer large areas of federally owned land to the state. Environmentalists will continue to look for a way to get Washington off what they call “coal-by-wire” energy from a coal-burning power plant at Colstrip, Mont. But moving most anything environmentalists favor through the Republican-controlled Senate could prove a tall order. And in the House, Democrats hold their slimmest margin in years, meaning Speaker Frank Chopp and his lieutenants could lose a vote with just a few Democrats bolting to the Republican side on a given issue. Even uncontroversial bills could have trouble advancing because of the short timeline and how much energy legislators are spending on the budget. For example, a measure tightening water-efficiency standards (HB 2430) that got a hearing in a House committee on Wednesday had no opposition. But the same thing happened in 2014 — it even passed the House with strong bipartisan support. It just never emerged from the Senate, lost amid the shuffle of other measures lawmakers there were pushing. So it seems that 2016 could be a year when little is accomplished on environmental policy by anyone. On the other hand, there’s an adage in American politics that no one’s “life, liberty or property are safe while the legislature’s in session.” The same could be said for Washington’s environment, the green groups say. $4.50 per building permit buys some action on climate change. But is it enough?